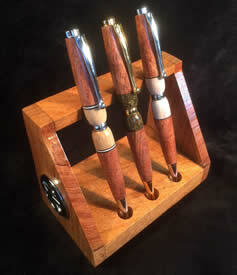 I really love The Texas Penwright's Mesquite and Live Oak pen because those are two of my favorite Texas trees. 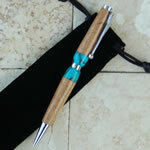 This Taking Texas with Me™ pen is the perfect VIP gift when you present it in its protective black velvet, drawstring gift pouch and the "Certificate of Authenticity" testifying that it's an authentic, original "Taking Texas with Me"™ pen. 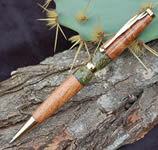 Learn more, or order this two-toned wood pen at The Texas Penwright.